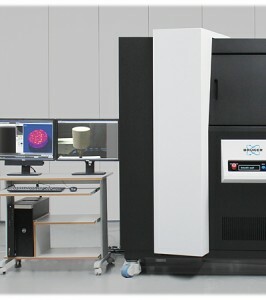 At Analytica 2014, Bruker launched the Bruker SkyScan 2211, a new high-resolution X-ray micro-CT (computed tomography) system with the widest available range of object sizes and spatial resolutions. For the first time, a single instrument is capable of non-destructive scanning and 3D reconstruction of internal micro-structures of large objects, as well as providing sub-micron resolution for small samples. The Bruker SkyScan 2211 micro-CT system can scan large objects up to 200mm in diameter, where high accuracy of <50nm for samples up to 25kg is achieved by high-precision air-bearing rotation. Combining a 600nm X-ray source with two X-ray detectors — a 3Mp flat-panel and an 11Mp cooled CCD detector — 8000 x 8000 x 2300 pixels can be reconstructed after a single scan. The smallest detectable detail (smallest pixel size) is 100nm. The SkyScan 2211 is supplied with one of the world’s fastest commercial software algorithms for 2D/3D morphological analysis and surface/volume rendering. Hierarchical 3D reconstruction speeds up reconstruction of the object’s internal microstructure 10 to 100 times compared to traditionally used algorithms, or to GPU-accelerated reconstruction. This brings the reconstruction time for a volume of 4000 x 4000 x 2300 pixels down to just 9 minutes. With the new SkyScan 2211 multiscale X-ray nanotomograph, Bruker sets a new benchmark for 3D imaging and modeling of larger and heavier samples, as well as for smaller samples with highest resolution down to submicron, all in one single instrument. The SkyScan 2211 opens the door to new applications in materials research and oil and gas exploration.